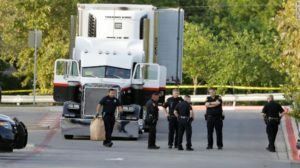 9 Immigrants Perish in Sweltering Texan Truck During Smuggling Attempt	"
On a blistering, 100-degree July afternoon in San Antonio, Texas, a phone call from an anonymous Walmart employee led to the discovery of 8 dead migrants in the back of a tractor-trailer. Acting Director of US Immigration and Customs Enforcement Thomas Homan, after speaking with survivors, speculated that more than 100 immigrants may have been crammed into the back of that 18-wheeler at one time. The Walmart employee who called the police was initially requesting a welfare follow-up regarding a visibly distressed individual who came to the store asking for water. The trailer was discovered with 31 injured from the inhospitable conditions and 8 others who had already lost their lives. The ninth victim succumbed to their injuries while receiving treatment at a local hospital. It’s possible that the rest of the surviving passengers fled on foot or with other smugglers. San Antonio Fire Chief Charles Hood, “…quickly called a ‘mass casualty incident’,” and ordered that, “…29 units arrive out there and start transporting people.” The Fire Chief also added that, “…a lot of them are going to have some irreversible brain damage,” due to heatstroke and elevated body temperature on the brain and other organs. According to officials, this tragedy could have been prevented had the air conditioning in the 18-wheeler been operational. Hood continued, “[it] was a refrigerated truck with no refrigeration.” It is unclear whether the passengers were locked in the trailer or not. The Federal Bureau of Investigations soon became involved and began reviewing surveillance footage captured by Walmart’s CCTV system. 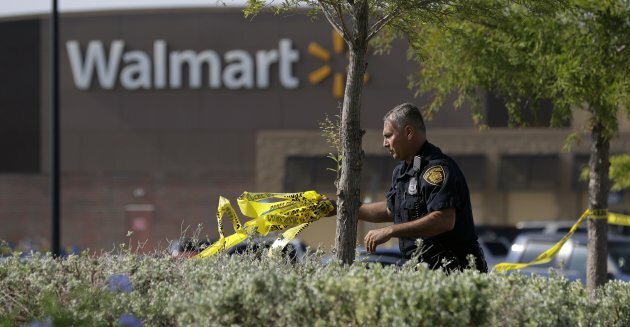 Walmart spokesperson Nathan Barr released a statement stating that, “[Walmart is] cooperating fully with the authorities but will not be providing interviews or footage to media.” It is currently unknown where the trailer came from or how long it was parked there. The driver, according The US Attorney’s Office, was James Matthew Bradley Jr., age 60, of Clearwater, Florida. Authorities further stated that Bradley was being held for his involvement in the incident and plans are in the works to officially file a complaint against Bradley. Homan stated that the victims will be turned over to his department upon their recovery. The migrants came from a variety of South American countries but Reyna Torres, Consul of Mexico, confirmed that Mexicans were among the dead and injured. One of the hospitalized is a young teenager, aged 15. Homan further commented that this case is the most recent incident of major human trafficking in the United States. Undoubtedly, it is safe to say that this case is also the most lethal documented incident to date. A tragedy such as this transcends one’s opinion of illegal immigration, whatever that opinion may be. Human suffering is just that–suffering. Those who engage in human smuggling and trafficking solely for the money lack empathy and concern for the well-being of those in their hands. It is an abuse of power and trust and it has a body count. This is certainly not the first situation of this kind. In fact, 2016 saw 1,522 criminal convictions for similar crimes. If anything, this catastrophe is testament to the problem of illegal immigration and serves as grim inspiration to find, pursue, and dismantle smuggling networks. Stricter immigration protocols need to be put in place to stop illegal immigration and, in the process, prevent future casualties by quelling smuggling and border-crossing operations before they escalate. We are reminded that the issue of illegal immigration affects both the migrants and the receiving country. We are aware, more than ever, of the humanity of migrants.